The 1857 massacre occurred when a group of settlers was brutally murdered, reports say, by Mormon Militia. Visitors to the area report cries on the wind and a feeling of great sadness. I visited there when I first moved to St. George 3 years ago, I had an overwhelming sadness come over me, and sharp pains in my legs. I’m in good shape, so it wasn’t the walking, it was different, like burning, or prickling heat, and it was in March, and cool outside. 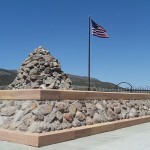 Monutain meadows was a case of Mormon extemism.non-mormons were moving through the area on their way to California when they were attacked by ‘indians’ who had been directed by the local Mormons. holdingo ut against the indians the settlers were ‘rescued’ by the Mormons who once inside the defenses proceeded to murder all the adults in the party. they couldn’t bring themselves to kill the small children and adopted them, which proved a fatal mistake as these children told the events to investigating federal cavalry. The local leader was executed but no one else was punished. That no one else was punished is false. My twice great grandfather was a Danite for Brigham Young, an enforcer and hitman. He didn’t know what he was getting himself into until the Mountain Meadows incident occurred. He helped some of the orphans return to their families, left the Mormon church and relocated to Nevada where he married a Paiute woman. We have photos of them together in their 1800s attire. She was very dark. Back then, the Mormon’s considered anyone of dark skin to have “the curse of Ham”. For marrying a dark skinned Paiute, leaving the Mormon cult, and for helping those orphans, my ancestor was executed outside his residence in Nevada by other Danites. Some of his family watched from concealment. I have a copy of his life story. Now, if you mean none of the rest of them was punished by the Feds, then, yes, I agree with you. It’s interesting how polarizing this subject still is. Remedy Hawk clearly harbors anti-Mormon hostilities and he wasn’t even there. (The “cult” label is the giveaway). I suppose some folks just need something or someone to hate. Se la vie. However, steering the discussion to what it was originally intended to be about, the area is haunted. Lights moving among the fields and sagebrush at night. Sounds of women and children weeping can be heard. A palpable sense of fear and foreboding as well. Not at the monument site, but the locations of the killings further to the north. Visited last week and heard a whisper as I walked the circumference of the field to the family monument. Ever since leaving in the quiet of mornings or as I fall asleep I hear distant screams, crying and gunshots. I conducted an investigation with friends there once. It was very windy so it was hard to pick up any recordings. It was also cold, so we sat in our a cars for a bit hoping the wind would die down. We were just chatting not expecting anything, and my K2 was sitting next to me doing nothing. My friend was telling stories about a ghost cat, and every time he brought up the cat the K2 would go off. We’d change the subject and nothing, them go back to the cat and it’s go off every time and only when the cat was mentioned. Who really knows why, but we decided whatever it was was listening to our conversation and responded to the mention of a cat. PS I think it’s time to move on from the Mormon debate and stop trying to convince others to hate them, much like the Mormons experienced at the time, being persecuted, murdered, and driven out of their homes, causing them to end up in Utah. It was legal to kill a Mormon then and the POTUS Van Buren refused to help them despite their “worthy cause.” It’s not a debate anymore. The Mormon church has admitted culpability and Mormons are very different today than 150 years ago. All religions have an ugly history. Christianity’s foundation is based on an innocent being crucified then continuing on by murdering anyone who didn’t believe as they did. I’m simplifying to make a point. Quit with the bigotry. It’s irrelevant. Try to focus on love not hate. People don’t honor the victims of 9/11 by showing up and spewing anti-Muslim hate. BTW, I’m not a practicing Mormon if being Mormon loses all credibility.